The Amazing Mr. X was a comic strip that ran in the Dandy starting in 1944, with a short run before being revived during the 60s. 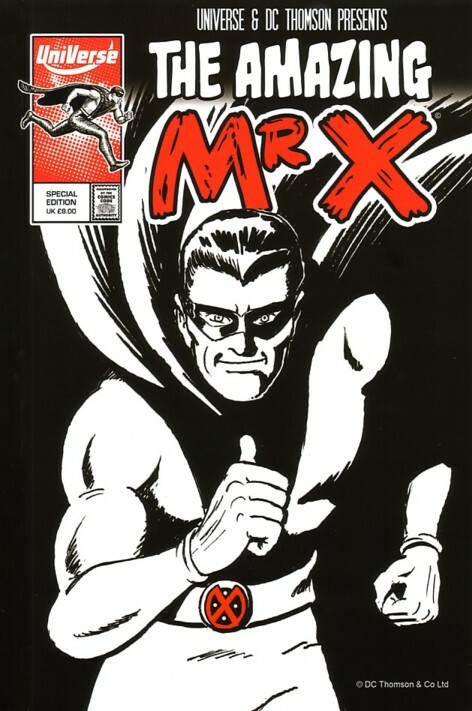 The closest thing that DC Thompson had to an original super-hero, Mr. X never really achieve the fame of his american counterparts, though there are theories that he was originally conceived at the same time Siegel and Shuster were pitching the first Superman strips. During WWII, DC Thompson was perilously short of material as so many of its artists were in the armed forces, and it’s likely that Mr. X was published as filler several years after it was first created during the initial superhero boom. We wanted to give this neglected super hero a new lease of life, and so for our 2012 Dundee Comics Day we asked for re-imaginings of Mr. X. We put the best entries into an anthology which you can purchase here.